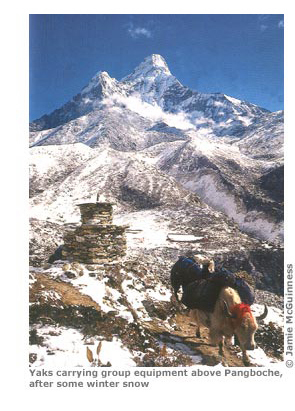 ...a practical and comprehensive guide to trekking in the Everest Region. The pick of the guides to the area. For any hiker wanting to plan a Chomolungma adventure, there is no better resource. Terrific maps. The fully revised sixth edition of this long-running practical guide with 27 detailed route maps, 63 village plans and trail descriptions covers not only the classic treks but also the wild routes. Information for all budgets and trekking styles – Ranging from lush terraced fields to the highest mountain on earth, the scenery is breathtaking. There are trekking possiblitities to suit all budgets, from independent tea-house trekking to all-inclusive guided treks with every luxury provided. There's even information on trekking peaks and passes of 5700m/18,700ft and over.